When you picture a beach wedding, chances are you're dreaming of the soft sand, cool ocean breeze and gorgeous sunset in the distance. But do your dreams include crowds of nosy onlookers, gusts of wind ruining your wedding hair or mosquitoes? When you picture a beach wedding, chances are you're dreaming of the soft sand, cool ocean breeze and gorgeous sunset in the distance. But do your dreams include crowds of nosy onlookers, gusts of wind ruining your wedding hair or mosquitoes? Oceanfront affairs come with their own special set of considerations, so we solicited advice from top planners who specialize in destination weddings. They dish on everything from choosing the right gown to windproofing your decor, to keep you worry-free while exchanging vows on the sand. Skip the big dress. Let's face it: A ballgown belongs in, well, a ballroom. "You may be able to get down the aisle in a full dress and long train," notes Paulette Davis of Bahamas Wedding Planner, "but walking on the beach and taking photos won't be easy. If a large dress is a must, make sure it can bustle easily." Think light. "Dresses with lace trim can be difficult because they pick up debris from the beach," says Kate Bentley of Happily Ever After Wedding Planning & Design in Key West, Florida. "Instead, choose a lightweight fabric like chiffon or charmeuse so your gown flows in the ocean breeze." Ditch the heels. Sand and high heels just don't mix. "Wear flat-sole sandals, espadrilles or wedges -- shoes that won't sink into the sand," says Banting. Have your gown hemmed with or without shoes, depending on which option you choose. "Remember, sand can get pretty hot. Have an aisle runner made of fabric or thick flower petals to help keep your tootsies cool." Consider an updo. "Think of the elements when deciding on a hairstyle," says Beth Helmstetter of Beth Helmstetter Events in Los Angeles. "A tried and true updo will keep you looking polished all night." Larissa Banting of Weddings Costa Rica suggests doing a trial run at your location. If wearing your hair down is the only option, Helmstetter recommends investing in the services of a stylist, who can do touch-ups throughout the day. Nix the veil. "When marrying outside, think twice about a long veil," cautions Stacy Mulcare of Ceremonies of St. John. "If it's windy, it will be a nightmare for you and the photographer." Instead, accessorize your 'do with fresh flowers or a fascinator. Bridal Suite Bermuda Weddings adds, "We save the 'penguin suits' for our many beautiful chapels and churches. Lightweight cotton pants or even Bermuda shorts are great options for the beach." Stay natural. A gorgeous ocean backdrop doesn't need to be too dressed up. Instead, highlight the natural beauty of the setting. "A beach wedding can be about shells and starfish, but it can also take inspiration from the harmonious color palette of sand, dune grasses, stones and water," says Karen Bussen of Simple Stunning in New York. "Decor should be simple; avoid going over the top with fussy flowers." Add color. To make your setup really pop, Sasha Souza of Sasha Souza Events suggests, "Choose colors that contrast the sand and the surf rather than blend in, like corals, greens and other vibrant tones." Go local. Celebrity-wedding planner Colin Cowie recommends hiring local vendors as much as possible. "Otherwise you might find your favors or chair covers stuck in customs." Tracey Kumer-Moore of Your Las Vegas Wedding Concierge adds, "When it comes to food, look for caterers who are conscientious of local markets and respectful of the beach environment." Get a permit. 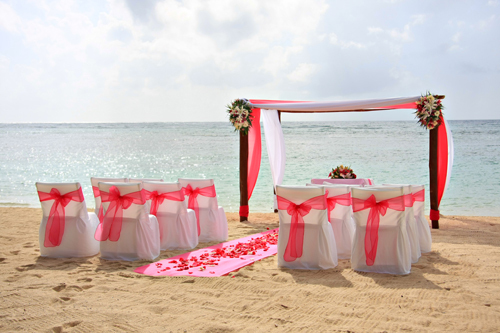 Research the required paperwork to hold your ceremony on the beach, especially if it's public. "Also, inquire in advance about noise ordinances, and be sure to follow them," Kumer-Moore advises. Ensure privacy. "Beaches are most crowded on holiday weekends, so avoid them unless you want the general public in attendance," advises Janet Renner of Royal Hawaiian Weddings. And remember, not all beaches are private. "Hawaii's are all public," reminds Evonne Wong of Events by Evonne in Hawaii. "We're not allowed to set up canopies, chairs or aisle runners. If you want decor, we suggest renting an oceanfront estate where you can have a secluded ceremony and still take photos on the beach." Time it right. When dealing with beach wedding photos, lighting is especially important. Barbara Fancsik of Eventful Moments Vallarta in Puerto Vallarta, Mexico, suggests ending the ceremony an hour before sunset. "That way, you'll still get great action shots in natural lighting, as well as sunset portraits." Set up a shoe station. Don't let your guests spend the day with sand in their shoes. "Provide a shoe check, where guests can swap their shoes for flip-flops and wipe sand off their feet," recommends Tara Guerard of Soiree by Tara Guerard. "It could include a bench, towels and a bucket of water." Provide shade. "Shade is your guests' best friend," says Soloway. "Consider creating a canopy to cover the seating area; for example, you could source some rustic bamboo poles and loosely drape thin white fabric on top." Have a seat. "Wooden benches, folding chairs and waterproof ottomans are great choices because they're heavy enough to withstand the ocean breeze," says Guerard. Offer Refreshments. To keep your guests refreshed, Soloway advises, "Set up a table with ice water, lemonade or a signature cocktail that guests can enjoy while waiting for the ceremony to start." Prepare for wind. A good rule of thumb on the beach: Anything that can blow away will. If you're using ceremony programs, weight them down with shells, tie them to chairs with ribbon or print them on fans, which perform double duty. And if you envision a perfectly petal-lined aisle, McWilliams advises, "Don't toss them until the absolute last moment, right before guests arrive." Keep bugs at bay. "Insect repellent is a good idea no matter the season or beach location," says Srimoon. Just make sure it's a brand that won't stain your gown. Speak up. You've spent so much time writing your vows and personalizing the ceremony, so be sure your audio doesn't get lost against the sound of crashing waves. "Rent a wireless microphone and speaker for your officiant to use," suggests Iraida Gonzalez of Belize Weddings. Inquire if your officiant, resort or DJ can provide this equipment, and do a sound check prior to the ceremony to ensure there's no unwanted feedback. Keep it short. Given factors like heat and audibility, Mulcare advises limiting the amount of readings and performances during the ceremony -- and make sure all participants know to speak clearly and loudly. Have a backup plan. Unfortunately, weather has a mind of its own, so be ready with a solid plan B. "To keep the party on the beach, have a canopy or tent ready," Cowie suggests. "Or find a space indoors where everything can take place." Anchor decor. Wind can topple tall floral arrangements, blow out candles and send other table elements flying. "Stay away from glass vases, which can easily break in the sand," warns Bussen. If tall centerpieces are your dream, Helmstetter recommends having the florist secure them to the table with heavy objects. "She can always cover these mechanics by lining the vases with ti leaves, palms or other natural elements." For lighting, "use hurricane-style lanterns or LED candles, which are flameless and longlasting," says Bussen. When wind-proofing place cards and favors, a little creativity can go a long way. "Tie sea horses to each place card," Helmstetter suggests, "and weigh your menus and napkins down with maracas or coconut shells." Rent a powder room. If marrying on a public beach, find out if there are bathrooms. If not, Natalie John of Dreamy Weddings & Tours suggests, "Hire an upscale portable lavatory for a few hours, especially if there will be lots of drinking during the reception." Keep warm. To help you and your guests fight a wind chill, Bussen advises, "Arrange a basket of comfy, color-coordinated pashminas to warm ladies' shoulders."